First wash the toor dal thoroughly. Pressure cook the dal in the cooker (2 to 3 whistles) with 1½ cups of water, tomato and turmeric. Either soak the tamarind or keep the tamarind in the cooker in a small cup with a little water. 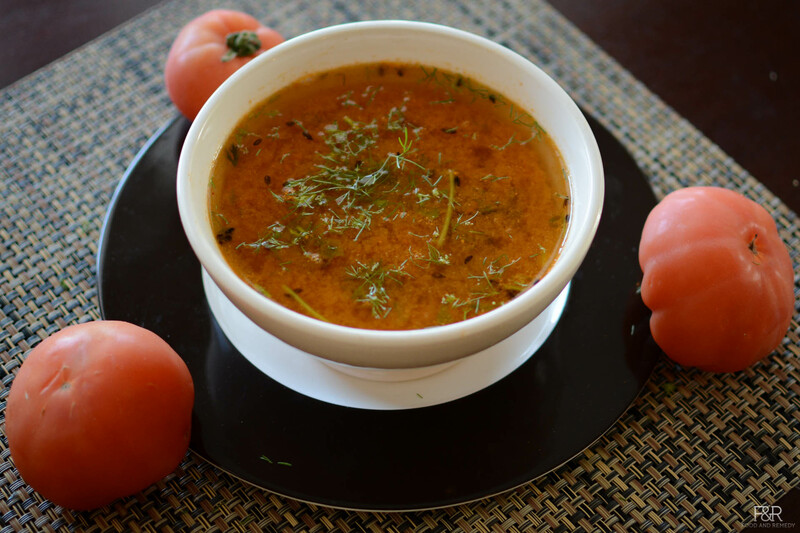 Once the cooker has cooled, mash the dal and tomato. transfer it to a pan Add more water, rasam powder, curry leaves, salt, and jaggery to the mashed dal. Let it boil for 6 to 8 minutes (you see the froth on the top). Heat the ghee in a ladle, and add hing, mustard seeds and cumin seeds. When they start popping, turn off the heat and pour it on the rasam.